Even so, clever programming can't fix the problem that has afflicted turbochargers since the technology was invented: lag. 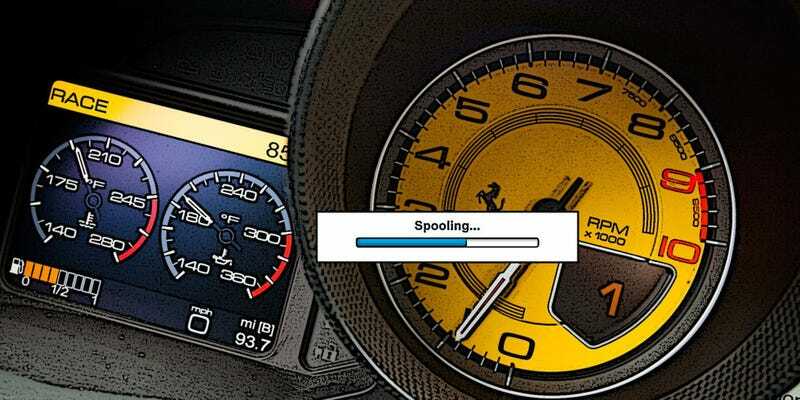 Ferrari claims the California's new turbo engine has "zero turbo lag" and "instantaneous response," then defines response time as "less than one second." Really? In a car that can hit 60 mph in three seconds, one second is anything but instantaneous. Immediate, predictable response is a requirement in any driver's car. Naturally aspirated engines react without delay to throttle inputs, but a turbo engine is vastly more complicated. It has two torque curves—one when it's off-boost and one when the turbo is at full puff. The transition between the first curve and the second is what we call lag—and both how long it takes and how abruptly it occurs change continually.